My Thoughts: This was an interesting romance with a huge cast of characters. 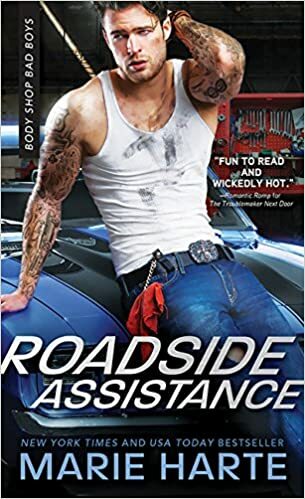 Foley Sanders is a big mean-looking, tattooed mechanic. Cyn Nichols is a plus size businesswoman who co-owns the coffee shop next door to the garage where Foley works. Foley and Cyn meet when she comes to the garage to complain - loudly - about garage cars overflowing into her business's parking lot. Foley takes one look and decides that she is the one for him. He works really hard to get that first date and then the fireworks happen. They start a hot and heavy relationship. The main problem in this story has to do with Cyn's problems with her body. She has been raised by a toxic mother who constantly belittles her as a way of "helping" her. Cyn has a terrible self-image and can't believe that Foley really likes her. Meanwhile, Foley has problems too. His best friend/brother Sam is jealous of his relationship with Cyn because he is afraid of being left behind. I liked a lot of things about this romance. I liked Foley's relationship with his mother. I liked the strong bonds of friendship between the guys at the garage. I liked Cyn's relationship with her sister-in-law Nina. I wasn't so fond of the the crude descriptions in the love scenes and the constant bad language of so many of the characters. Fans of grittier romances will enjoy this one. Yet even as she felt it, she chastised herself for allowing a man to make her feel one way or another about herself. She had to stop fixating on her looks. If she wanted other people to see past her body parts, maybe she should start with herself. I sometimes cringe and squirm at uncomfortable sexual scenes. Sounds like some good characters though. And I like the quote you shared. So true.